Monkey and Squidge: …still buzzing! 3 What do I put my products in if by chance I sell anything! (Which I wont so there's no point in going!) …I had no idea how expensive bags are to buy or how long you can spend looking on the internet for the 'right' bag! 4 …as a continuation from 3… bags are so expensive that's my profit I'm eating into!!! …loved my clear bags though and have to admit I was slightly disappointed when people didn't need a bag!!! 7 did I mention I could be humiliated! …101 – I DON'T WANT TO DO IT! …come on, you know I obviously did. I woke up at 6 this morning and told myself to go back to sleep… which of course I didn't due to the fact that I still had a mouth to sew on, a quilt to finish, 3 labels to print, 4 labels to attach, a quick trip to sell a monkey before the fair and a monkey who needed a quick spin in the washing machine and tumble dryer! I have to say getting up early was quite good but I was so ahead of myself that I did start to bounce of the walls a little… but my family were fantastic, they all get dressed when I asked (including Guy… and if you know Guy you'll know that's an achievement!!!) and we were all packed up and in the car ready to set up at 11. So I'm sounding quite confident right! Wrong… I had a space in the main hall, FAB! Hhhmmm… I wanted to be tucked away in a corridor away from everyone – remember I really didn't want to go, (it turned out to be a great spot though), but once I was set up I was really quite pleased with how it looked but notice the crossed (slightly nervous) arms… oh yeah and that smile. Pretending not to be nervous I took a cup of tea that I was offered… big, BIG mistake, I have no idea how I managed to keep the tea in the styrofoam cup!!! Shaking? Me? No! I'm not shaking!!! I have an affliction don't you know! I'm sure I'm allergic to styrofoam cups, bring me out in an uncontrollable shudder! So as my voice went up a few octave's "GUY, quick can you take this for me… QUICK TAKE THIS!' my husband… my rock… rescued me from near disaster! – I have to say I couldn't of done it today without his support over the past few weeks and of course today! So I'd like to say right now a huge thank you… with a promise that I will once again start ironing (and washing, and hoovering, and cooking tea, and shopping – actually it's surprising what you can still mange to make with very little food but I am fed up with being referred to as 'old mother hubbard'!). All this said, I have lived to tell the tale and actually I did really well. I have had great sales and rather a lot of interest! 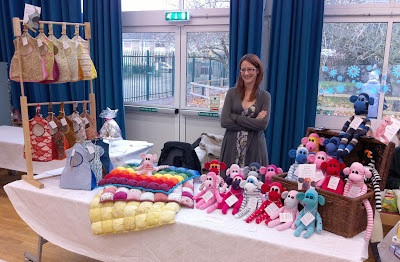 …and dare I say (in a slightly muffled voice, and rather quickly…) "I'm planning my next craft fair!"Ahem! Oh yeah… I'm also planning the next set of boy monkeys… they were very popular. …I think my boys expression says it all… and only £2! …and a slightly more relaxed me and in the background my good, understanding, supportive husband! (who looks slightly bored!). …and a huge round of applause for all the support today for our school, I have just heard that we raised £5918.00 and with matched funding it could possible be £8000.00 – not bad for an ickle school fair! Please feel free to leave a comment… unless it's about my fixed smile! …I may not be blogging for a while now – I have a very untidy house!